Greenwich Peninsula (home of The O2) is a nice place to meet-up with friends. With our Oyster Card fully loaded, Lorenzo and I spent about £10 per head on a 5 hours long day out. A day at The O2 doesn't have to break the bank. For Londoners and tourists with a fully top-up Oyster Card, a day out at The O2 could cost you as little as £10 inclusive of hot lunch - you just need to know where to go. Lorenzo arrived at The O2 from London Waterloo via the river bus, Thames Clippers. Discount fares for Oyster Card holders. 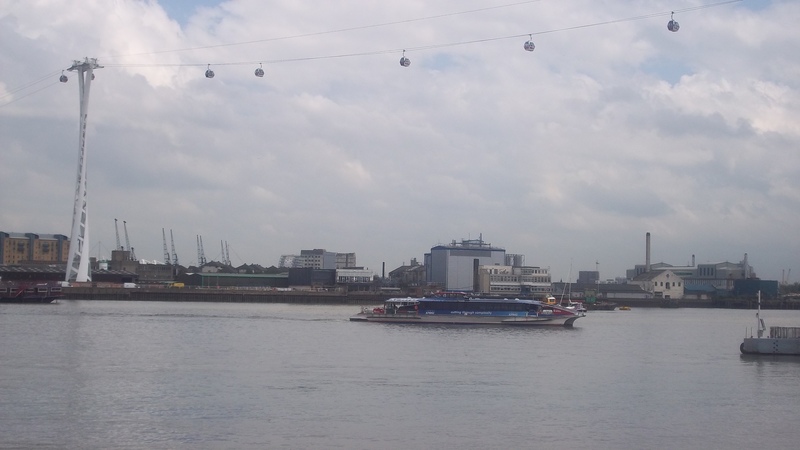 I took the Cable Cars from East London - Royal Docks. Discounted fares are available for Oyster Card holders. The view along the riverside is lovely. We talked and walked-up an appetite, then went to The Slug for lunch. Eating at a discount: The Slug and Lettuce. 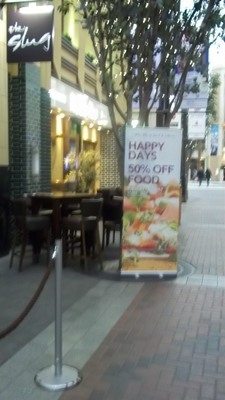 The 50% discount off menu orders at Slug and Lettuce in The O2 complex was handy. Efficient and friendly staff. You must ask for the passion fruit drink –non alcoholic cocktail. The chicken souvlaki and a cup of tea came to £6. Lorenzo ordered char-grilled chicken caesar salad with the passion fruit cocktail drink, totalling £7. At The O2 complex, people pay to take part in climbing the building - Up at The O2 is priced at £22. Basically, people climb over The O2 and walk around the whole 360 degree building. More about Cable Cars and Thames Clipper. Riding on the river bus, Thames Clippers, is a cheaper way of sightseeing all the main iconic London landmarks. Thames Clippers set sail from The London Eye pass through The Tower Bridge, Tate Modern, Big Ben and many other landmarks. Return fares vary with a discount for Oyster Card holders and students. 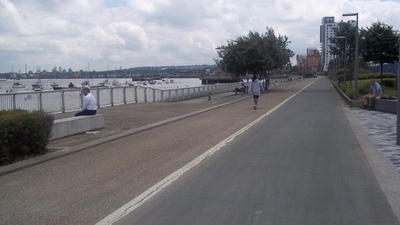 I see the Cable Cars as an environmental friendly substitute way of crossing Thames rather than driving through both the Blackwall and Rotherhithe Tunnels which can be congested and very busy during London events. Once you take the London Cable Cars, there is no point driving to The O2 ever again. Why? A day at The O2 doesn't have to break the bank.